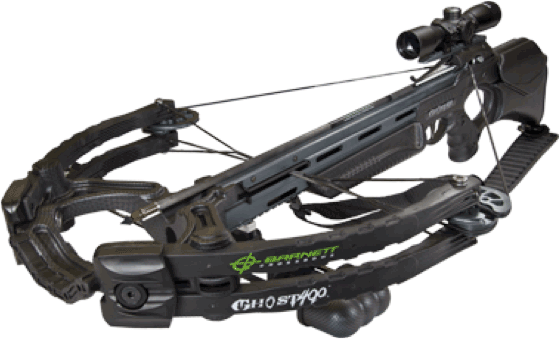 Tarpon Springs, FL: Barnett Crossbows is the world's number one manufacturer of crossbows. Thanks to break-through innovations combined with pioneering patents year after year, Barnett builds bows faster, stronger, and lighter than the competition. This year proves to be no exception with an impressive line of products that are sure to resonate with hunters across the country. Most notable among them is the new 2012 Barnett Vengeance and Talon Crossbow Sling. Personifying a steely resolve and determination, the new Barnett Vengeance crossbow is aptly named. The Barnett Vengeance represents a quantum leap in crossbow evolution. It is the first crossbow to combine a lightweight CarbonLite Riser with reverse draw technology. As a result, the Vengeance exhibits significantly less vibration and noise than a traditional draw crossbow without sacrificing speed or accuracy. In this radical new reverse draw configuration, the limb pockets are moved closer to the trigger assembly and the limbs face forward on the bow, thus shifting the center of gravity closer to the shooter's body. This drastically reduces the weight at the front of the crossbow, which is essential for a well-balanced shot. In addition, the Vengeance features a CarbonLite Riser assembly, which further reduces the weight without compromising strength or accuracy. The most technically advanced riser ever created for a crossbow, the CarbonLite Riser removes approximately 43% of weight from the riser, which dramatically shifts the balance point to the shoulder. The combination of the reverse draw design with the CarbonLite Riser allows the Vengeance to provide the steadiest and most accurate shot possible. Decorated in a carbon fiber finish or in a high-definition camouflage, the Vengeance is available through retailers as a complete package with crossbow, quick detach quiver, three 22" arrows and an illuminated 3x32 Multi Reticle Scope. Like all other Barnett Crossbows, the Vengeance is proudly made in the USA. Kinetic Energy: 126 ft. lbs. 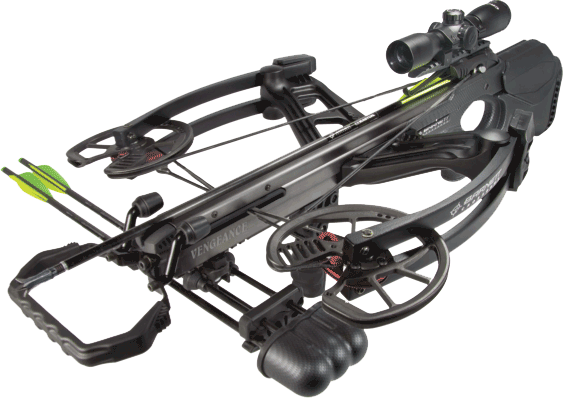 In addition to the new Vengeance, Barnett has also added to its extensive line of premium crossbow accessories. With an existing full line of products that include soft cases, rope cocking devices and multi-tools, Barnett has focused on every detail to ensure your hunt leaves nothing to chance. 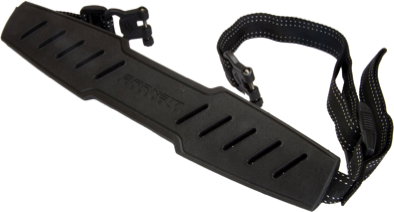 Joining these other fine accessories for 2012, the Barnett Talon Crossbow Sling is designed specifically for Barnett Crossbows. The Talon, aptly named for its extreme grip, offers a superior non-slip surface to keep your crossbow in place even in less than perfect conditions. The Talon is adjustable from 32" to 40" and features a quick release buckle, allowing for quick and quiet attachment. These impressive new products join a family of some of the most technologically advanced bows on the market: the Ghost 400, Buck Commander and Penetrator. Not new for 2012 but still at the top of high-end crossbows, the Ghost 400 perfectly blends performance and comfort leaving nothing for want. The Ghost 400 leads the industry with raw power, shooting at lightning speeds of 400+ fps. 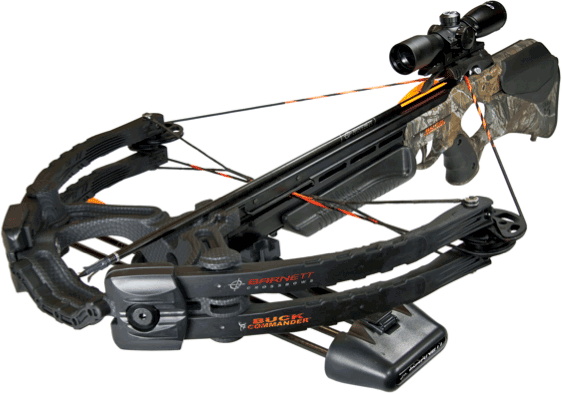 This crossbow features Barnett's proprietary Carbon Riser Technology and it is by far the lightest and strongest in its class. The Ghost 400 provides one of the smoothest shots available, thanks to the CNC machined aluminum flight track and a 3.5 lb. trigger pull. Additionally, the Anti-Dry Fire trigger assures the safest experience available while delivering maximum down range accuracy. The Ghost 400 is also equipped with Barnett's over-molded laminated limbs featuring Anti-Vibration Isolation technology, reducing noise and vibration up to 30%. The Crosswire® strings and cable system are standard and feature Cable Armor, which significantly increases the longevity of the strings and cables. The Ghost 400 package comes with three 22" custom carbon arrows by Easton, Barnett's new Talon crossbow sling, the New Carbon Cross® 3-arrow quiver with hip attachment, a rope-cocking device and finally a premium paper-sighted illuminated scope. Kinetic Energy: 151 ft. lbs. For the deer hunter who demands perfection from himself and his equipment, the Barnett Buck Commander is the obvious choice. Shooting 365 fps with a 14-inch power stroke and packing 126 ft. pounds of kinetic energy, the Buck Commander is a leap ahead in crossbow power and performance. Among many of the Buck Commander's standout features, one of the most notable is its handling and superior balance. Like all Barnett premium crossbows, the Buck Commander comes standard with a CarbonLite riser. The Buck Commander is also equipped with custom composite limbs encapsulated with Barnett's Anti-Vibration Isolation technology. In addition, the Buck Commander features an aluminum flight rail, Barnett's Whiplash Cams and Crosswire® Strings and Cables, which blends Barnett's fibers with the industry's toughest serving materials, ensuring the shooter has the most stable and reliable string in the industry. As a result, shooters experience a faster, quieter, and more precise shot. The Buck Commander is available through retailers as a complete package with the crossbow, a Barnett illuminated 3x32 multi reticle red/green dot sight, a quick-detach quiver and three high-quality Easton 22" arrows. 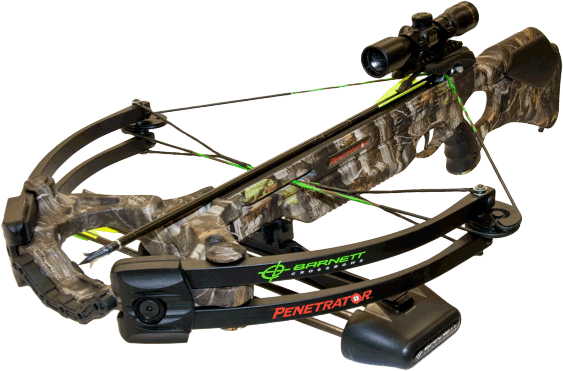 The Penetrator Crossbow by Barnett is designed to do exactly what its name implies. This powerful and deadly bow delivers bone-crunching penetration with the pinpoint accuracy necessary for more success in the field. Loaded with new innovations and patented designs, the Barnett Penetrator is a perfect example of why Barnett is the world's number one manufacturer of crossbows. The Penetrator's shoot through foot stirrup and power stroke of 12 inches produces impressive speeds up to 350 FPS. The unique shoot-through riser lengthens the power stroke of the crossbow without placing the cocking string beyond arm's length. This allows for increased speeds and higher stored energy levels in a user-friendly and compact design. Barnett's high-energy cam system and Crosswire® Strings and Cables also contribute to a faster, quieter more precise shot. The Penetrator's sleek design features a patented magnesium riser and composite stock, which are known throughout the industry for their durability.With these features and much more, the Penetrator excels in speed, accuracy, strength and performance. Kinetic Energy: 116 ft. lbs. From its inception over a half century ago, Barnett Crossbows has led the industry with pioneering innovations and patents to become the world's number one manufacturer of crossbows. Barnett's engineers have created its latest range of crossbows based on the changing needs and desires of today's hunters. Lightweight, adjustable and powerful, Barnett has brought crossbow technology to the height at which it stands today. Barnett is committed to delivering high quality performance products with unparalleled service and value for all that use the Barnett Range. Built for maximum speed, efficiency and Built for the Hunt!